If you own a free-standing wood stove you need an Ecofan! This unique accessory is designed to sit on top of your wood stove and circulate warm air through the room quickly and efficiently. 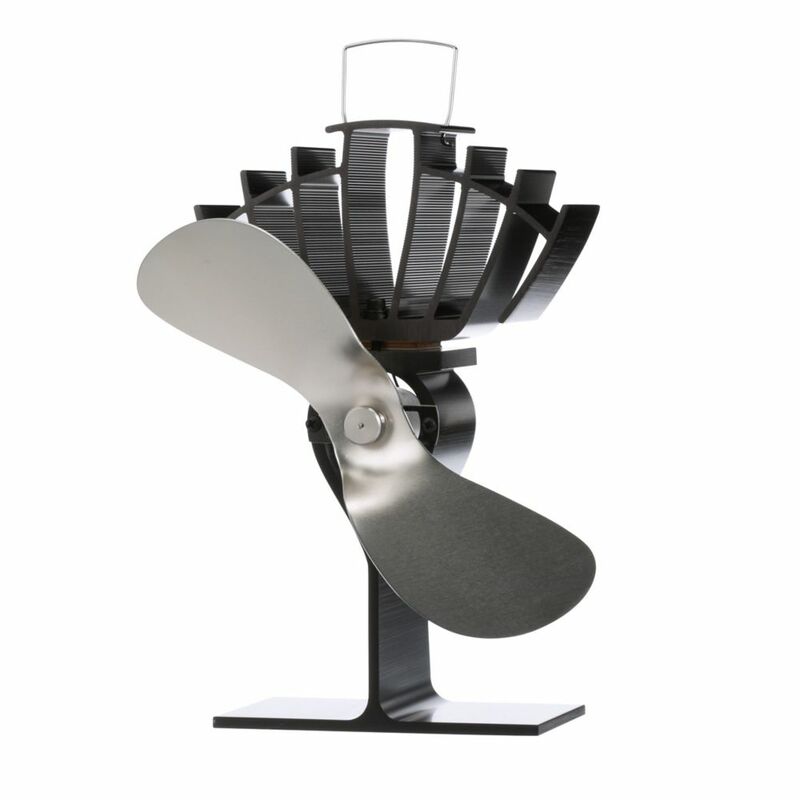 By creating its own electricity from the heat of your stove, Ecofans do not need household energy or batteries. And unlike noisy built-in blowers the economical Ecofan is whisper quiet. THE ECOFAN ULTRAIR<sup></sup> is the intermediate model in the Ecofan family, moving up to 125 cubic foot of air per minute (CFM). It is the midsize model at 9 tall x 5.5 wide x 3 long and comes with your choice of gold, nickel or black blade colour. The UltrAir operates at a stove surface temperature range of 212F 650F (100C 345C). Supervent, The insulated tee is used for through-the-wall installations using a wall support. It allows the horizontal connection of the chimney to the appliance and provides access for inspection and cleaning. Supervent Chimney has Embossed Coupler, Solid Pack Insulation, Stainless Steel Inner Liner and Outer Casing with Twist-Lock Connection for easey assembly. This convenient Kit includes the parts common to all straight-up Chimney installations through a Flat Ceiling. Just add Chimney Lengths and a Roof Flashing to complete most installations. EcoFan UltrAir 810CAKBX If you own a free-standing wood stove you need an Ecofan! This unique accessory is designed to sit on top of your wood stove and circulate warm air through the room quickly and efficiently. By creating its own electricity from the heat of your stove, Ecofans do not need household energy or batteries. And unlike noisy built-in blowers the economical Ecofan is whisper quiet. THE ECOFAN ULTRAIR<sup></sup> is the intermediate model in the Ecofan family, moving up to 125 cubic foot of air per minute (CFM). It is the midsize model at 9 tall x 5.5 wide x 3 long and comes with your choice of gold, nickel or black blade colour. The UltrAir operates at a stove surface temperature range of 212F 650F (100C 345C). EcoFan UltrAir 810CAKBX is rated 4.3 out of 5 by 11. Rated 5 out of 5 by Pat from Works good to move heat around the front room.... Works good to move heat around the front room. Rated 5 out of 5 by Anne from Although we have not used these yet, I have been in a home with it during northeast winter months... Although we have not used these yet, I have been in a home with it during northeast winter months, can't wait to use them in our own homes. Rated 5 out of 5 by Mark from Using it in a converted cargo trailer camper. Works... Using it in a converted cargo trailer camper. Works like I hoped! Rated 4 out of 5 by Lou from I wish I had bought the larger model. This one... I wish I had bought the larger model. This one works well but still would like more air flow. The heat distribution is still better than it was without the fan. Rated 2 out of 5 by Ronald from Does not move as much air as I expected. Good... Does not move as much air as I expected. Good as far as there is no electricity required. Rated 5 out of 5 by DJ from I built a rocket mass heater in my workshop, which uses a 55 gallon barrel. I bought this fan to... I built a rocket mass heater in my workshop, which uses a 55 gallon barrel. I bought this fan to help spread the heat coming off the barrel. All I had to do was pull the tag off the fan and set it on the barrel. I did have to spin the blade the first time, to get it going, but I have run the RMH several times since then and each time the fan has started by itself. I am going to buy a second unit, so I can blow the heat in another direction, for more coverage. In hindsight, I would buy a bigger unit. I think I would still buy a second fan, even if it was bigger.